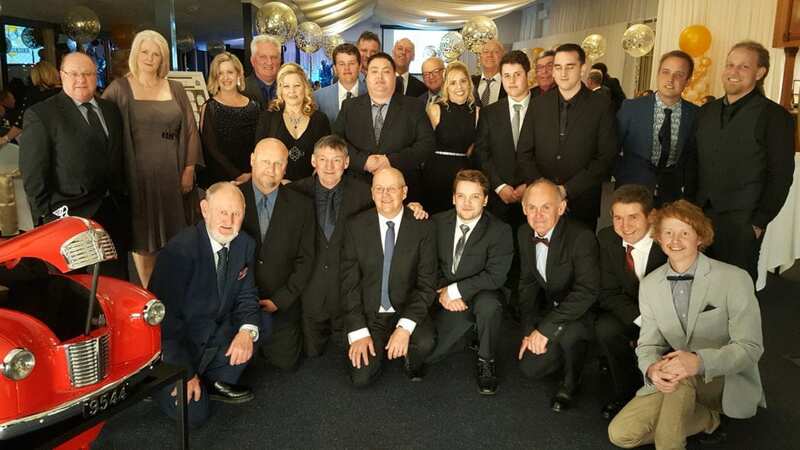 S &S Industries celebrated their 50 years of business in grand style with more than 180 employees, suppliers, customers and family members enjoying a wonderful night at Burswood on Swan in Perth on 19th August. MC Trevor Salamon did a great job of welcoming guests from all around Australia to the event and introducing the many speakers; all more than happy to share their stories and congratulations with the audience. The speakers included Rob O’Neill of Septone (supplier), Wayne Phipps and Mike Wilkinson (long time customers and body shop owners) as well as Tony Siroen, Director and son of the founder Willie Siroen who quietly took a back seat to enjoy the evening. Tony shared his parents, Willie and Greta’s, story of arriving into Australia in the early 50s from Holland, meeting and marrying in Perth and setting up various businesses including a used car yard before becoming a supplier of thinners to the industry. The many stories were funny and informative but at all times keeping to the theme that Willie has employed all of his working days and in life of “always look ahead, never behind”. It is a testimony to Willie and his business principles that more than 70 percent of the staff have been with the company for more than 10 years and many with more than 20 years of service. Guest suppliers from interstate included Colin Edwards (GPI-Melbourne), Nick and Ron (Mipa Australia-Melbourne), Paul McMartin (SAPE-Sydney), Joe Kaltoum (Concept Paints-Sydney), Damian Cappelluti (U-POL Australia-Sydney), Corey Smith (Chemspec USA-Qld) and Rob O’Neill from Septone in Queensland who came out of retirement to attend! Suppliers from Perth included Tony Hubycki from Oz-Gel. There are not too many businesses, especially family businesses, that have served the industry for 50 years – congratulations to Willie and his family on this milestone. With sons Tony, Jeff and Ron all involved in the business along with grandsons Brent and Daniel another 50 years is not out of the question. The National Collision Repairer congratulates S&S Industries and thanks them for their service to the industry.